Brazilian Jiu Jitsu (BJJ) is one of the fastest growing martial arts and combat sports in the world. At PMA you will start by building a strong foundation of jiu jitsu techniques designed to teach you how to survive a street fight at grappling range. 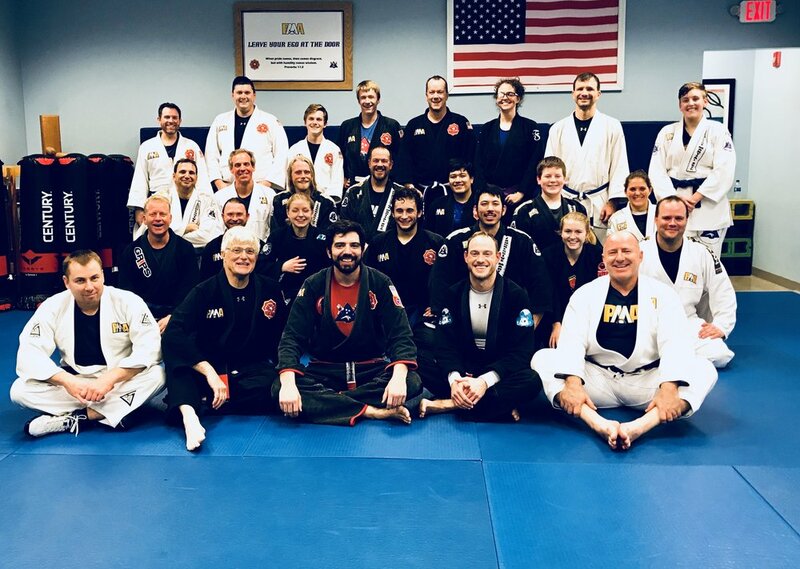 From there, students that are interested in continuing their Jiu Jitsu journey will begin to explore the thousands of techniques in this ever evolving game of "human chess." Most importantly, PMA has been teaching Brazilian Jiu Jitsu for over 15 years and have designed a curriculum and learning environment that will keep you safe, while providing the highest quality training you can find. PMA's chief instructor, David Corrigan, is a 2nd degree Brazilian Jiu Jitsu Black Belt, trained by Pedro Brandao Lacerda (a direct student of Carlos Gracie Jr at the legendary Gracie Barra Academy in the Barra de Tijuca neighborhood of Rio de Janeiro, Brazil) and BJJ world champion, Felipe Costa.